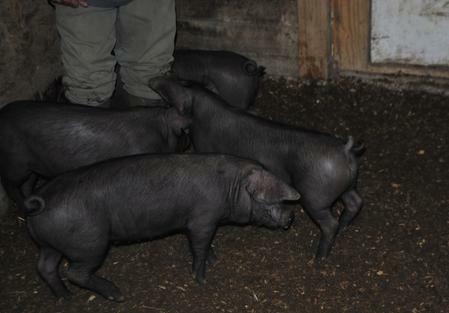 We bought our first piglets in December 2014. We planned for them to be raised for meat. Instead we kept the 2 girls. Girls are called gilts before they have ever babies, sow’s after having had babies. I decided why not raise babies ourself instead of buying “feeder” pigs each year? The 2 barrows (neutered males) we took to the butcher. It is the best pork I have ever had. I could be a vegetarian but Art wont eat any vegetables at all. As second choice I prefer to raise our own food as much as possible. We have milk goats, free range chickens and now pork. The calves/cattle we couldn’t keep fenced…. they kept going through everything. We know what goes into our milk, eggs, and meat this way for us and the dogs. Plus we can give them a better life, even if its not very long its lots better then living their short life in a confinement operation. Art wouldn’t eat any pork for a long time that we had raised, and would rather buy from the store. I don’t get it. I imagine the sad confinement places where they live when I’m at the store. He remembers the critters we have here. I respect that for sure, but I much prefer saving a few from living in commercial operations. Anyway, meanwhile I looked into breeds and thought the Large Blacks sounded terrific. 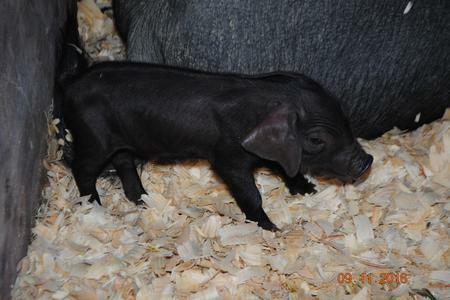 They are an old heritage breed with only a few registered stock left. 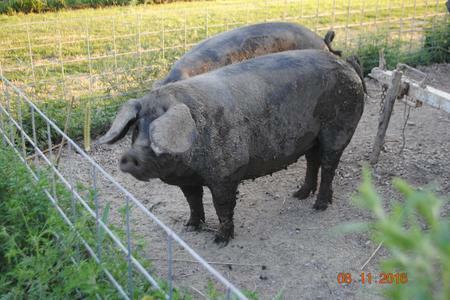 They graze more then “root” and are suppose to be very docile and even tempered, perfect for pastured family farm hogs. Plus suppose to be good mothers. History of our beginning with hogs below. It turns out they are very prolific, grow fast, and we are supplying our family and extended family with as much pork as they would like to eat. ​The Hampshires were scary to be around. The one barrow acted like he would bite you and they all were so pushy you really wouldn’t want to fall down near them or even turn your back. Plus they tended to run startled at the least thing. The one gilt, Big Pig was the easiest going. The other Gilt would shock herself on the fence at least daily and walk up behind you with her mouth open and seemed way to aggressive, and really dumb. We call her “Crazy Pig”. 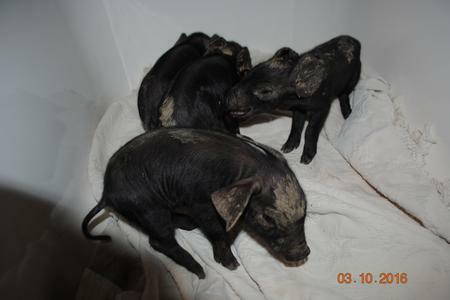 We found a registered Large Black baby boar in Arkansas, and 2 registered baby Large Black girls locally. The local breeder has been really nice and educational. We “rented” the Large Black boar from him to breed the 2 hampshire gilts we had kept back.​​ When he was here dropping off the boar and picking him up he agreed Crazy Pig was pretty aggressive and wouldn’t be living at his house, she would be at the butchers. Since we didn’t want Big Pig to be suddenly by herself we just put the boar with both the girls. 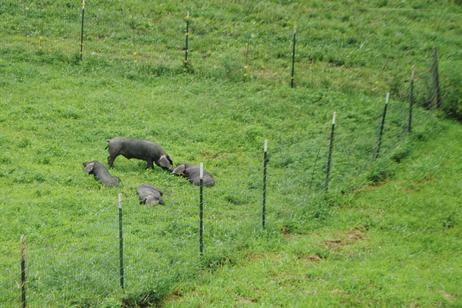 Big Pig was the first to farrow, then Bad Mom had her four. A few weeks later Crazy Pig had 9 babies and raised them all. The last was one of the large black gilts, who had and raised 7. She still doesn’t have a name. From never having piglets to having 4 gilts farrowing and raising litters its been educational! We thought the piglets would sell as feeder pigs, which is what people buy to raise out for themselves. We haven’t sold any for feeders. Now they are bigger and considered “suckling pig, and roaster pig” size. I am guessing relatives are getting pork for Christmas and we will see if the butcher shop also buys them. We will have way more pork then anyone can eat, well the dogs would probably be really happy! Our very first baby piglets! She raised 10! 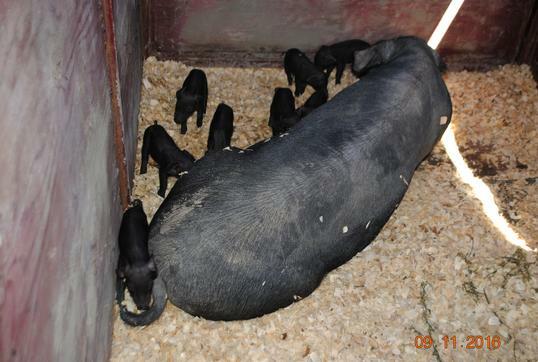 Mom is “Big Pig”, a Hampshire, and dad is a Large Black. We were running them into the house as they were born afraid they would be too cold, or mom would just eat them. It was really cold outside, and we didn’t know when she was actually due and hadn’t prepared ahead of time. My son-in-law said “oh put them back with mom!” “She wont eat them, pigs are good moms.” His uncle raised hogs so he had lots of experience from working on the farm. She was making terrible noises but apparently she was calling to them. Boy its hard to know what to do when you don’t have a clue. She is a really good mom and didn’t eat them, even when they walked right across her mouth. 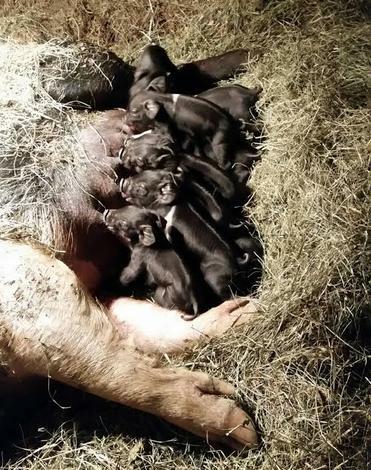 ​Mom pigs lay on their side and don’t move while having the piglets.Its like they are in a trance. Strangest thing I have ever seen! Photo of one of our 4 young sow’s, bad mom, and behind her is Fat Albert, our Boar. My Aunt Carole named him as soon as she seen him. They are a year and a half old now. 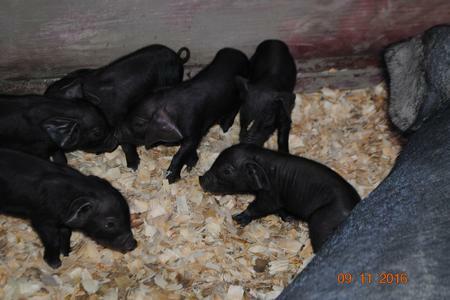 The other photo is the 4 piglets in the tub, who are now on pasture and getting quite large! The piglets were bottle raised. Bad Mom, (named after she had babies and wouldn’t take care of them!) had them and didnt have anything to do with them. I have their story on the blog page. They were born 3-10-16. They had me so tired I can’t remember anything from around that time! We saved all 4 of them. Fortunately the other 3 gilts raised their pigs all by themselves and only needed us people to keep the feed and water replenished. Since Bad Mom wasn’t raising her babies she stayed with Fat Albert and was bred back. We figured we would give her one more chance to be a good mother. Well she had 9 babies 9-9, and finished morning of 9-10-16. Have long story on the blog. She was just as bad about wandering about and not staying with the babies at all! The whole story is on the blog page. In short we managed to get her into a stock trailer where she and the piglets had room but were also contained to stay closer to each other. It worked since I stayed in there almost the whole day to be sure the piglets started to nurse. After all that she is now caring for her babies. She has been good but hogs are quite large so accidents can happen. Like watching the little guy walk between her and the wall, when less then 24 hours old! Pictures 9-11-16 day after I finally got her to lay down got the piglets to nurse. 9-24 Art came in with one of the babies. We don’t know what happened but he’s limping and not acting right. The vet tech has wanted to raise a piglet, so he will be given to her as soon as we can meet up. Since I had bottle fed all the babies when they were born before the mom would take them he adjusted to the bottle easily. Poor baby seem like his back hurts to me. We think mom accidentally mashed him or stepped on him. All Bad Mom wanted to do was lay with Fat Albert in the mud wallow. This photo is Fat Albert in the wallow. Bad mom is in the trailer with her piglets. Soon as they are sturdy enough we will move dad and let mom and the babies have the pen where they can get in the wallow. I much prefer them nice and clean but they much prefer mud wallows! February 2018. The frozen ground had a huge thaw. The spigot by the hog pasture had been leaking all winter flowing into the front section of the pig pen where the water trough and one of the 2 hogs feed troughs were. Art decided he needed an impromptu vacation. I was left with an overwhelming disaster, 2 sows with big 4 months old babies, 2 sows who were very pregnant due anytime with only 2 pig shelters were where all the pigs currently slept. I had him move the stock trailer in there a few weeks earlier to set it up for an additional shelter since the 2 sows were looking quite pregnant then. He never did fix any of it up. The mud was over ankle deep so trying to feed and water was a nightmare. The other end of the pasture was dry but you couldn’t get to it without walking through pig wallow slop 15 feet wide. I didnt realize it had become such a mess since it was mostly frozen last time I was out there. Art is in charge of taking care of maintenance and critter upkeep for all the outside animals. I was livid. With all the chores dumped on me suddenly and the 2 sows about to deliver I called for help. Told my daughter, Kim, who works for us regularly now, and my son, Keith who also works for us regularly to help figure out what to do asap, like today. Keith came over and we cleaned out a horse stall in the barn and used the pile of hog panels to make a corridor from the pig pasture into the barn. We planned to herd the big pregnant sow into the nice dry protected stall for her to have babies. Well she refused to leave the pig pen!! We tried everything, food, using a big pig board to guid her smacking her on the rump with our hand, nothing would get her to got out the gate. She acted like she was already in labor and did not want to leave her familiar surroundings. We were stuck not knowing what to do so we had to leave her in with all the others. Keith was going to be gone for 3 days for work in the 1.5 weeks Art was gone, so he helped do some basic chores and then when he got back was able to take off a few days from work to help get the pigs set up. Art could not have left at a worst time. Fortunately Kim talked Justin, my son in law, into coming out to figure it all out. Meanwhile the first pregnant sow who would not leave the pig pasture took over the better shelter and had 8 piglets, 7 live and one stillborn the day before Keith had to leave. Amazingly the little piggies stayed in the hut, they would not have been able to get out of the mud if they had tried to leave the hut. Keith hung a heat lamp and we gave them shavings hoping that was enough to help them survive the cold. It was so cold I didn’t think they could make it. Incredibly the 7 that were born alive all survived! The big sow hogged the hut and kept the others out, and she laid in a way to help hold the heat for the babies. I was so upset and frustrated I couldn’t do anything better for them. Moving a huge 400 plus pound sow who does not want to be moved just doesn’t work. Justin is an excavator and as a kid his uncle had hogs. He brought over a backhoe dug out and replaced the leaking spigot that should have been fixed the previous summer. He and Keith got the whole wet mess dug out, got drain tiles, put them in and then covered the whole area with clean rock. It is just amazing! Its all dry, even with the torrential rain we have had all of March and April, days and days of rain its all nice and dry! 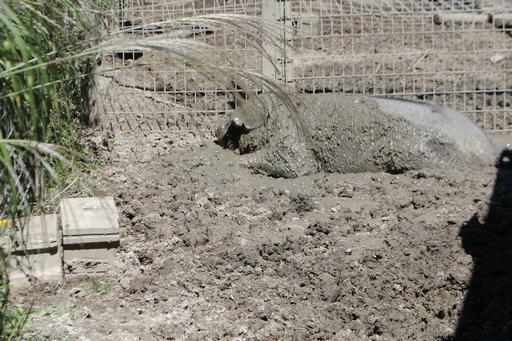 We can now water the pigs really easily, theres not mud all stuck on the feed and water troughs. Keith attached both feed troughs to the fence so the pigs cant shove them all over and its even easy to feed. In the process the second hut was old and fell over. They just shoved it out of the way. We set up the old stock trailer for the other pregnant sow. They put a lean-to up against the existing hut for shelter also so the pigs who had used the old hut still had a big shelter. The little babies got excited and would run in and hut of their hut with the heat lamp while the work was happening. I don’t know how they knew the ground was now walkable. They are just so cute! The big sow also delivered while Art was still gone. She was in the stock trailer with shavings, food and water but had been in and out and so nervous I think it seriously upset her labor. I should have stayed out there that night but it was so cold and I was so exhausted trying to keep up with my chores and Arts chores with minimal help while the guys worked on the hog mess I hoped she would wait till the next day. In the morning we found her with 7 live tiny pigs and a huge slew of still born pigs. I think she held off delivery with the big backhoe spreading the gravel and finishing up, all the noise and excitement. It was so sad I think 3 other may have been alive and she laid on them. She had 17 all together! The trailer was really far from the barn. Art came home the next day. I cant even remember now if Keith had hung heat lamps in there. It became so windy and cold the piglets were really cold. I told Art they have to have a tarp over the trailer to keep the wind out. He found one and put it on. He came back with a tooth ache and still was unable to help do chores but he had to help get them warm enough. They looked so much better after that. When they were a couple weeks old we opened the door and let them mingle with the others. They could go in either hut or trailer that had heat lamps. It wasn’t long before they moved to the hut with the other mom. The tarp kept blowing around. 1.5 months later the tarp is now stomped in the dirt off the trailer. They are so close in age we don’t know who’s are who’s. The piglets will nurse off either mom. Its amazing how well they all get along. Even the other huge now 5 month and over hundred pound each babies don’t bother the little pigs and they all sleep together. How they don’t get flattened I will never understand. I have it on the list for another nice solid shelter to be built in there. Keith is planning to also put up a fece within the pasture to be able to keep the boar separate so we can plan when, or at least know just when the sows are due. It is really easy to tell just looking at them a week or 2 before they deliver that they are getting really close. Last October when Art went on an impromptu vacation the same thing happened. I went out the feed the evening he left and one of the sows was trying to make a nest having early sings of labor. I slept in a chair by the pen. The other mom was also really close to delivering anytime and nothing was set up. The one probably got upset with me sitting there and Keith and I locking her into the hut so she didn’t do anything for another 1.5 days until I was looking She broke out of the hut, and had a live baby and 2 babies who had wandered off and drowned in the pig wallow. I had to open the makeshift fence and them make the live baby scream trying to lure her back into the hut. Making a baby pug scream to get a huge sow to run after you is not smart. I was all by myself, Keith was at work and Art was gone. But without her behind the fence more could fall in the wallow. I ended up putting the baby pig in a tub in the hut, and getting a big board and harassing her until she finally wandered into the hut. She had 7 more after that and raised all 8 of them. She didn’t try to go through the fence with all her babies with her. she just had not been happy being moved and penned up. She wanted to have them next to the hut. Not a very smart sow! The other sow who was huge round had hers I think a few days after he got back. I cant remember we had SO much going on! It was a crazy time. We had just moved my mom and aunt into the new little house we had built for them. Art had said he wanted to go on vacation when it was done. It wasn’t done so I didn’t know he was planning the trip. What wasn’t finished still has not been finished but its all little things. My aunt and mom love their new house. We love having my mom on the other side of the driveway! She is much happier too so not near so crabby. win win situation.